Asakusa is always an exciting place and definitely the most popular tourist attraction in Tokyo. It’s even more exciting when you come across a seasonal event. I’ve talked about cherry blossoms in April, the morning glory festival and yearly Hozuki Market in July on this blog. 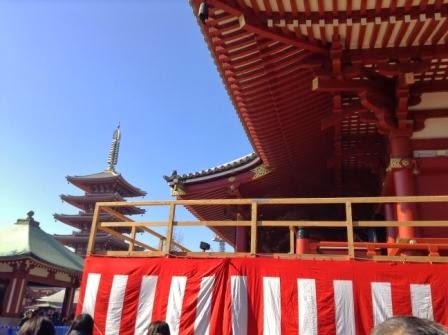 Today, it’s Setsubun Festival at Sensoji Temple. First of all, what on earth is Setsubun? In short, it is the day before the first day of spring in the Lunar calendar. It was 3 February in the Solar calendar in 2015, and it is so or near 3rd Feb every year. 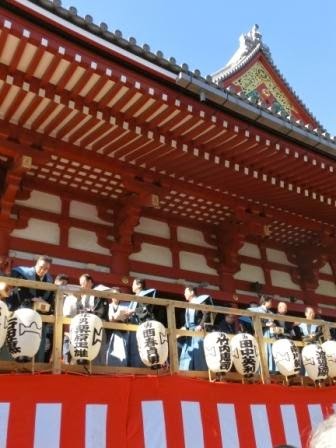 Things Japanese locals do on Setsubun are on the Setsubun post of last year, and this post will be more exciting. 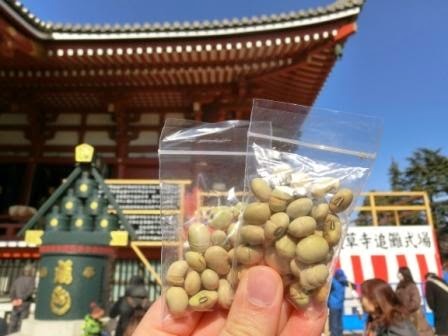 It’s a report of Soybean-scattering festival in Asakusa Sensoji Temple with photos and a video! I’m happy to share this fun event with you on this half-seriously-cultural, half-joking post. 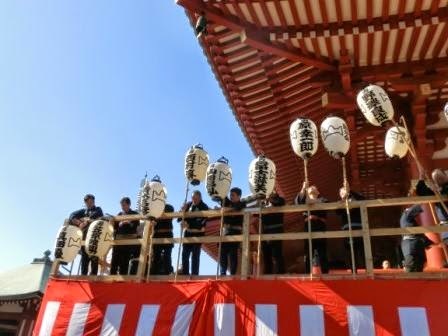 Sensoji Temple, the very symbol of Asakusa, is said to be the first temple which held big Setsubun events. They prepared a temporary stage for the festival right next to its main hall. The red and white curtain is traditionally displayed in formal and happy events such as New Year, graduation ceremonies, etc, in Japan. It was lucky that it was warm. At 11:30, the first parade from Nakamise Street to the main hall started. Then people brought traditional lanterns to the stage. You see, something exciting would start soon. Then, people in traditional costumes appeared on the stage. They are Asakusa locals called, “toshi-otoko (= year-men)”who were born in a year of the Year Animal. 2015 is a Sheep Year, so they were born in a Sheep Year, which is 12, 24, 36, 48, 50…. years ago. (So people of Monkey Year will appear on the stage next year.) The Tale of Year Animals has influence on many aspects of Japanese culture. They shouted, “Oni-wa-soto! (= Eject demons! )” “Fuku-wa-uchi! (= Welcome good luck! )” with the priest. It is considered to be lucky to catch soybeans (they are packed in these events,) so people are excited and desperate to get some!! I held a camera in my right hand to record my Nice-Catch scene, and stretched my left arm! Attention: My camera is NOT stable. If you are a person who get motion sickness easily, be careful to watch. Trust me, I did have a Nice-Catch scene, but I failed to record it. These soybeans you caught are considered to be a good fortune, so you can eat them. Actually, to my sadness, I lost one of the packs somewhere in the temple… It sounds like I dropped half of good luck I’d caught. No! I still have one! 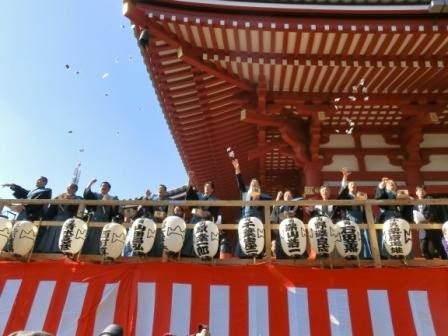 I’ve caught one good luck to visit Setsubun festival in Asakusa Sensoji Temple. So I had one pack of soybeans with thanks while I was waiting for a return train. Sensoji Temple held two more soybean-scattering on the day; One was from 14:00, the other was from 16:00 with some celebrities invited to scatter soybeans from the stage. Traditional events tend to be too firm and boring for people of today, but you see, Setsubun is not at all. It’s a fun event for children to grown-ups. I think it is important for traditional cultures to remain. 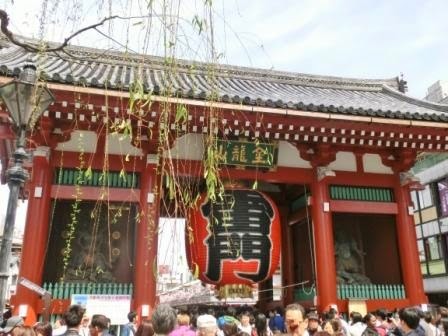 The next Setsubun is in 365 days, but Asakusa is always a fun place for both international travelers and Japanese visitors. Until the seasonal events coming, enjoy Asakusa on my blog. Good luck for you, too! !